The COINS are made of high quality metals with a SOLID Brass core and plated with a Silver Alloy metal. The coins are DIE STRUCK not die cast and minted with HAND tooled DIES. They are then hand painted with a BAKED on Enamel and coated with a CLEAR Epoxy coat to preserve the coins forever against the elements as well as human skin oils. They are shipped in a BLUE Velvet box for not only safety but for display. For every coin purchased, $5.00 (25% of coin sales) will be donated to the respected organization (charitable foundation) for each coin. Go here for an accounting of the funds raised. Each coin purchased will be delivered with an official donation certificate and shipped in a blue velvet display case. some in the Line Of Duty, Others innocently! Secure transaction via Pay Pal. Use the "shopping cart" buttons to place your order. Please allow up tp 4-6 weeks for delivery. However, most shipment can be sent within 24 - 48 hours & shipped via U.S.P.S. PRIORITY MAIL shipping for Domestic U.S.A. See the CHART below. Or: Send THIS Order FORM mailed to us with a check or $.$$ Order. These coins and images are copyrighted © 2002 2003 PublicSafetyNet / CyberSoft / American Patriot Coins / Mitch Mendler and registered with the Library of Congress of The United States of America Copyright Office. Absolutely no permission is given under any circumstances to use these images or the likeness of the images in a digital, electronic, printed or any other format for any reason especially in a Coin or a Pin. All artwork used was provided with permission from the sorce (photoraphs or graphic images). Some of the art work was completed with "clipart" and "royalty free" images. The DIES created and some of the drafts and image scanning were created under "contract for hire" with the primary images, and or ideas being the sole creation of Mitch Mendler, sole owner and proprieter of the finale art work. 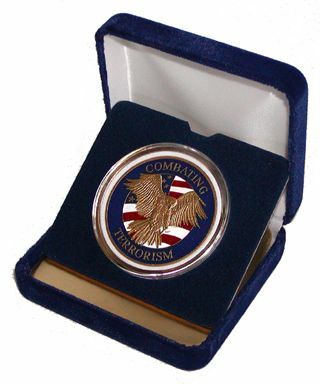 American Patriot Coins and PublicSafetyNet are businesses owned and operated by CyberSoft. All three companies are licensed in San Deigo County, California.